There is an interesting new Chinese company called Octominer that is apparently focusing on the GPU mining market by offering a specialized mining motherboard for 8 GPU mining rigs. The Octominer B8PLUS motherboard has 8x full size PCI-E slots spaced decently enough to eliminate the need to use PCI-E riser boards. The manufacturer suggests that the motherboard is suitable for any Nvidia or AMD GPU that is 4.5 cm or thinner, so all 2 slot thickness cards should fit, 2.5 slot cards might also fit, but very tightly and there could be some trouble with cooling them. Furthermore the motherboard comes with integrated Intel mobile CPU with built-in graphics. The motherboards uses SO-DIMM DDR4 memory and comes with M-SATA slot for an SSD memory and a sATA interface for an external HDD or SSD drive that you need to buy separately of course. 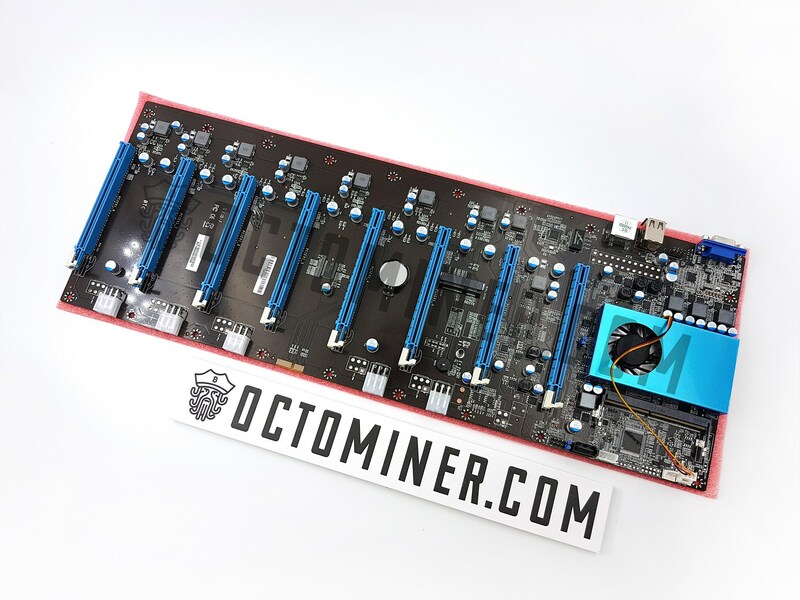 The price of the integrated 8x GPU mining motherboard from Octominer is currently USD $199 with shipping from China (shipping and import taxes and VAT not included). Shipping is with DHL Express and should take about 5-7 days according to the website and cost you $25 USD for most locations, though the price may vary for some regions. Octominer is currently accepting pre-orders for the motherboards with deliveries expected to start shipping by the end of January or the beginning of February, so not much wait, though shipping may not be immediately after you order.